Disclosure: I received a free canvas print in exchange for writing this review. When I first got my latest camera, I was literally taking pictures of everything! Especially wildlife. I just love trying to capture candid moments with wild animals, and it's always just a goal, to try and get a good picture. Well, one night shortly after I got my camera, Aaron and I were outside. We noticed that there was a common tree frog outside on one of our trees. So I thought I might as well get my camera, and try to take some pictures. When I was about to head back outside, I decided I would just grab a piece of lettuce. I'm not really sure why, as I had never tried feeding a wild frog before, but for some reason, that night, it just sounded like a good idea. So I grabbed a little piece, and that is where the fun began. I went back outside, and put my hand out toward the frog, with the lettuce. Within a couple seconds, the lettuce was gone! The frog snatched that lettuce out of my hand, like he hadn't eaten in days! After he grabbed it, he just sat there in the tree, with his mouth clenched down on the lettuce. Aaron and I were both in shock at this point, but I clicked away, and got a couple really awesome pictures. It was so hilarious to me, as I had never had an experience like it before. Capturing it on camera was a huge plus! 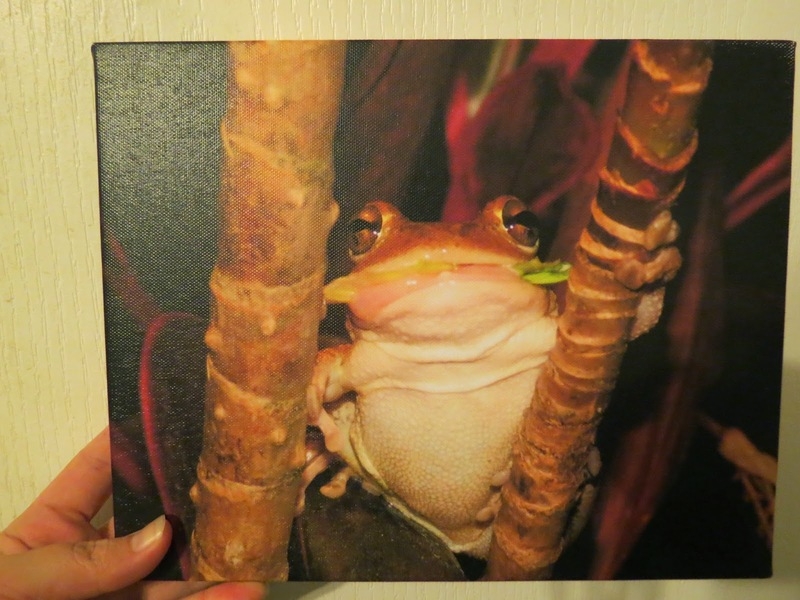 Now it's one of my favorite stories to tell whenever I'm talking about my camera, and I love that Easy Canvas Prints helped me preserve my memory, so I can let everyone know about our little frog incident. To top it off, the picture turned out really great, and it is one of my favorite pictures I have ever taken : )! 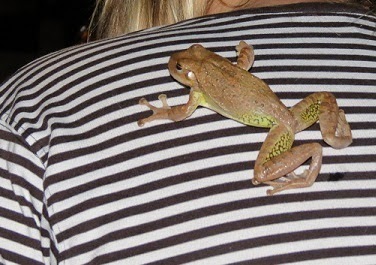 Just a bonus: The frog did jump on me eventually - Definitely a memorable night! 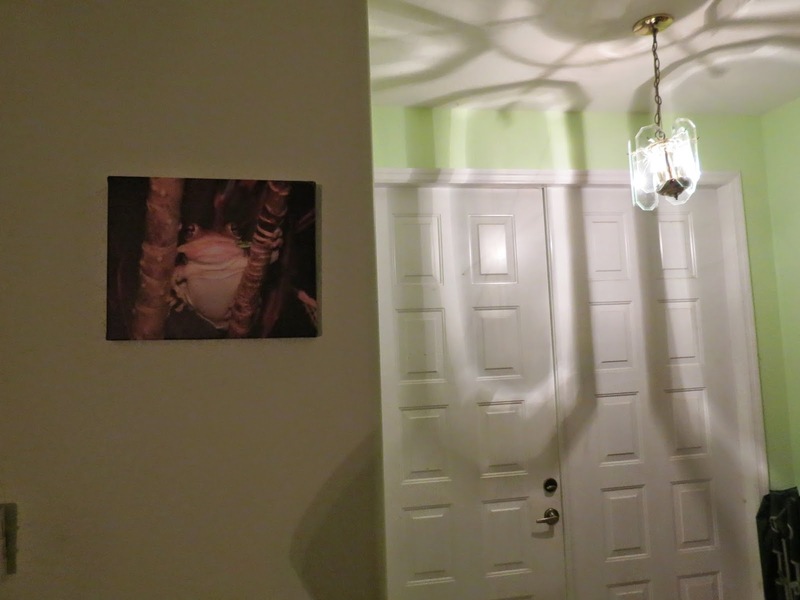 Disclosure: I received a canvas print from Easy Canvas Prints, for free, in exchange for this review. All opinions expressed within this post are our own, and were not influenced in any way. Must be 18 years or older to enter. Open to US only, No P.O. Boxes. NO PURCHASE NECESSARY. This giveaway starts on May 24th, 2014, and will end on June 4th, 2014. Winner will be drawn via Random.org via Rafflecopter, and announced on top of the Rafflecopter form, as well as on the top "Winners" page. The winner will be emailed and will have 48 hours to respond to my email before a new winner will have to be drawn. If you're tweeting for entries, you must have an "unlocked" account. The number of entries received determines the odds of winning. VOID WHERE PROHIBITED BY LAW. I would love to have a canvas of my fiance and I together. We have two already but of both of our kids. Thank you! If I won, I would put the picture of my brother and his wife on my canvas. It would make a beautiful late wedding gift! Our family picture from our wedding! I took a cool pic of some artists painting out in a field in Cades Cove, TN. It's the best pic I have ever taken and would love to put it as art on my wall! I think I'd print a photo of my friend's dog (who passed away not too long ago) as a gift. I would use a photo of our new baby boy. There isn't a single photo of him hanging up yet! Love then froggy! I would print a pic of my furry baby with my human baby boy baby! I would choose a picture of my family. I would choose a recent family photo taken in the park. I'd get a family pic.